My apologies for the delay. I seem to be moving at a snail’s pace lately, haven’t I? Anyway, just popping in to congratulate the winner of our 501 Bento Box Lunches Book Giveaway! 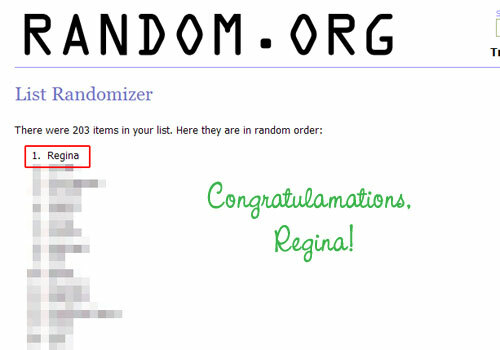 Congratulations to Regina of Minnesota! I guess birthday girls are lucky. She celebrated her birthday on the last day of the raffle. Enjoy your book, Regina. It should get there in a day or so—I hope you like it! Thanks to everyone who participated. The response was overwhelming—largest amount of entries out of all the contests I’ve had, I think. I wish I could give out more prizes, but unfortunately, my resources are limited. Thank you for participating, everyone. I hope your enthusiasm will be the same for future contests and activities. This entry was posted in admin, cookbooks and magazines, giveaways and tagged 501 bento box lunches, bento box, book, cookbook, graffito, lunches. Bookmark the permalink. Thank you so very much. It made not just my birthday but my week! Can’t wait to get it. Wow, congrats to Regina for winning! This really is your week. Also, thanks to Kaoko for hosting such a wonderful contest! Congrats to Regina. Lucky you!